I’m going to be as transparent as I possibly can with my knowledge of Achtung! Cthulhu. I’ve never played the much-acclaimed tabletop role-playing game. My board game expertise goes as far as Monopoly and the Game of Life. So, why am I reviewing this title… Well… I love turn-based strategy, XCOM, Unity of Command, Shadow Wars et al. I also love shooting Nazis, especially occultist Nazis, because they are badest of the bad. When I read that Auroch Digital was creating all of the above, I was right on board. Your squad is made of four very individual and unique characters. Given the rich lore on which the game is based, this is a no-brainer. Auroch is blessed with cherry-picking from some fantastical archetypes, replete with deep backstories and character profiles. Corporal Akhee. “The Eye” Singh is a close quarter specialist armed with a deadly shotgun and knife combo. Sergeant Brandon Carter is the sole US soldier in the brigade. Initially, he was equipped with a standard Thompson submachine gun, but I swapped this out for the far more powerful Bren LMG (light machine gun). I thought he would be an ideal candidate as a long-range deliverer of lead death. Next up, we have Captain Eric ‘Badger’ Harris from the secret British Section M department. He’s not only a top commando but he’s also savvy with weird weapons and how to use them effectively on the battlefield. Finally, we have my favorite of the team. Ariane Dubois from the French resistance. She’s an extremely capable fighter with her trusty Luger pistol. Fast and agile. I found her to be the perfect “Point women”. Oh, and she also has a pet demon which she carries around on her shoulder. Which is nice. The game world is set in the Forest of Fear, a spooky part of the Ardennes. The timeline is 1944, where the Nazis are making one final assault on the Allies. 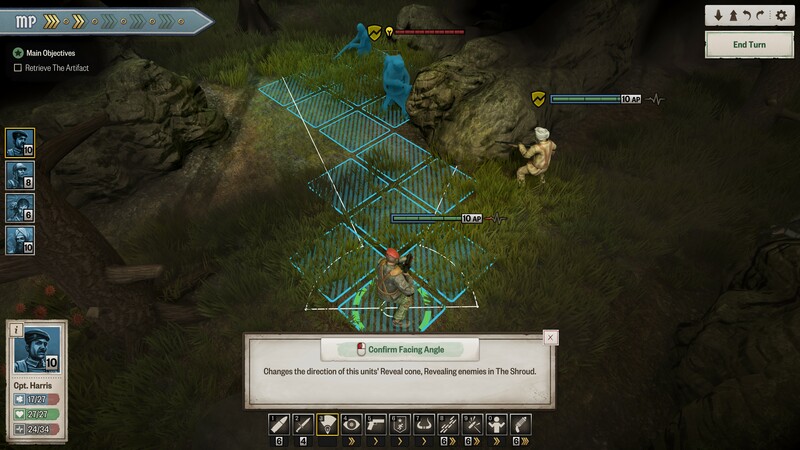 Missions are played out on sprawling isometric maps. These consist of large open areas connected by corridor-like paths that cut between the dense woodland. The whole environment is covered in a fog of war known as “the shroud”. This not only acts as an immersive special effect but is also a fundamental part of the gameplay. 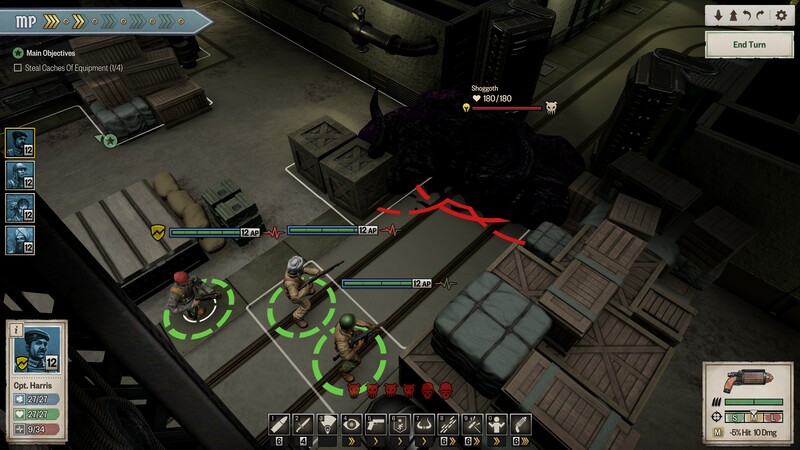 When an encounter starts, you can see shadowy figures moving around the perimeter of your team filed of view. Not knowing what is out there inhibits not only your shot accuracy but also your tactical plans. 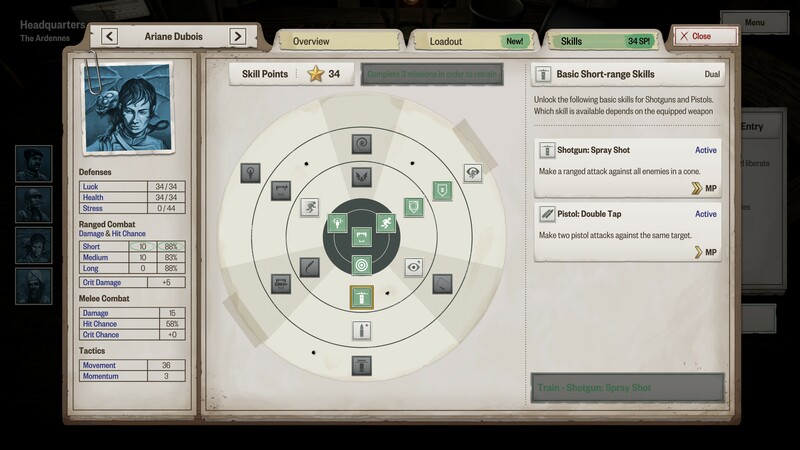 An extra layer of tactical goodness has been added to the default turn based rule set. The Momentum system can be used to bolster your normal arrays of movement and attack rolls. This fills up as your shots hit their targets. This enables each character a choice of special actions. These can be anything from snapping secondary weapon chances (normally a pistol), overwatch stances, or melee charges. 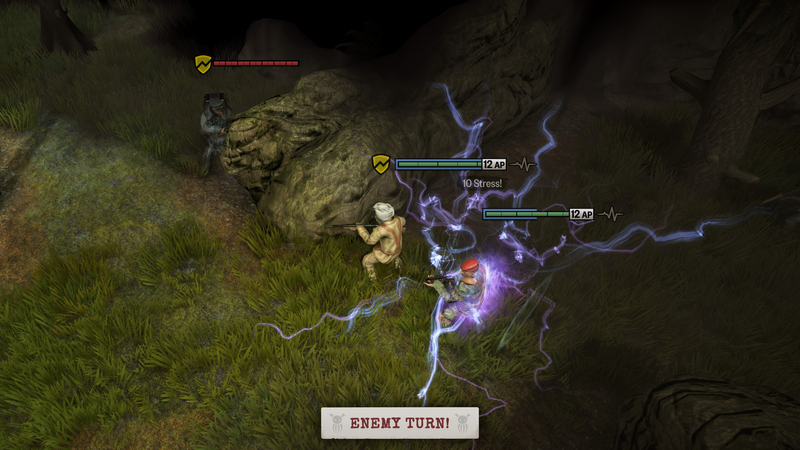 The latter skill is a great nod to British war heroes old and new, where they upped the bravery and daring doo factor to the next level. Another feature which is new to me is the fact that you can jump between characters within their turn. The last few TRPGs that I’ve played normally have action points and characters locked together. ACT breaks this convention by allowing you to mix and match movement /actions in a free-form ballet of strategic goodness. This is a great feature which I used to my advantage by assessing hit percentages on enemies. Within the opening few missions, you are limited to a squad of four, so it’s paramount that they stay alive. A downed team member cuts your attacking prowess by a quarter. By carefully switching characters, I could pick off bad guys systematically by gauging the dice rolls in my favor. Set in a horror based universe, your team can get stressed. This is displayed as an ECG style meter. As your character comes under fire and takes hits, it fills up. When they have had too much they break down under nervous exhaustion. This takes control away from the player and makes the hero act erratically, firing shots willy-nilly in all directions. Auroch has done a sterling job of transposing the heroes from the Achtung! Cthulhu fictional world. This has been achieved by some great cooperation with modiphius. 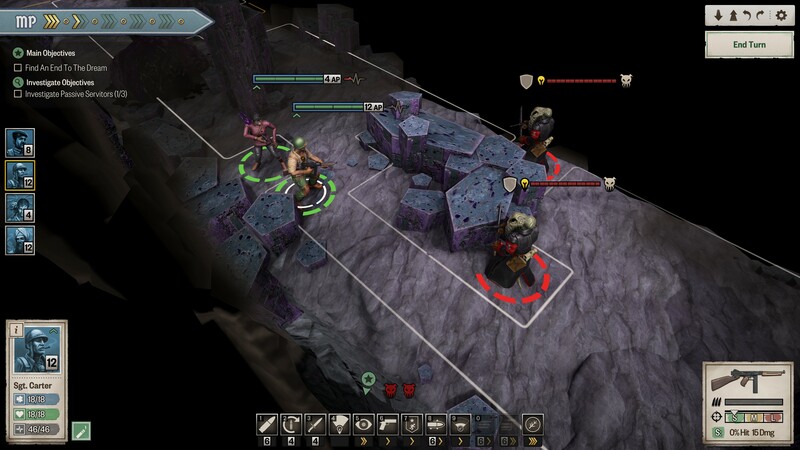 They have utilized the original CAD data (used to make the tabletop miniatures) in order to faithfully recreate the 3D models found in the game. They have then brought them to life with some cool animations. I particularly like the vaulting movement when traversing cover such as fallen trees and sandbags. The maps are littered with authentic period touches such as burnt out half-tracks, concrete bunkers and command posts. This is offset with some fantastical Lovecraftian dreamscapes, bestrewn with obelisks, runestones and geometric interlocking basalt columns. All these art assets have been overlayed with a nice suite of particle effects. The Shroud is not a static mist, it rolls, churns and boils, adding an overbearing sense of doom. When the combat kicks off, weapons fire is accompanied by bullet traces, blood spatters and blast waves. Occult spells take the form of colorful clouds of debilitating miasmas. The spot effects for the weapons stood out to me. I’m not a massive FPS fan, so I can’t compare with the latest battlefield shooters. However, I have watched many many World War two films such as Saving Private Ryan and a Bridge Too Far. The Bren gun sample was spot on, giving off a punch, heft, and resonance. Sounds you would expect to hear from a heavy machine gun. 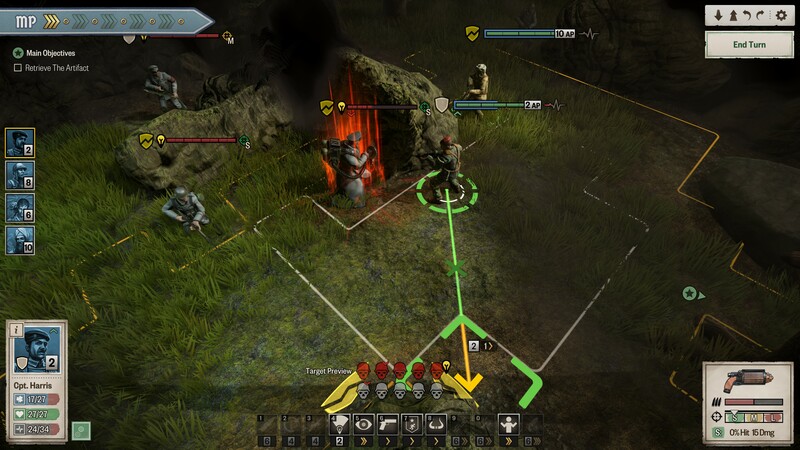 As with my last review (Depth of Extinction), ACT uses a follow command between skirmishes. 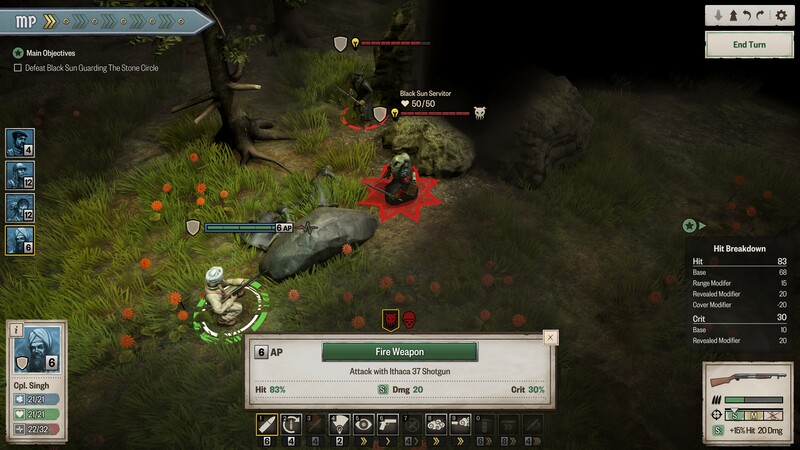 This cuts out the busy work and keeps the player focused on the gameplay. I encountered a couple of issues with the camera during the enemy phase of the gameplay. The dynamic camera angle showing foes moving around the shroud was sometimes obscured by the surrounding scenery, whether that be an overhanging branch or dense foliage. This was annoying and was a bit of double whammy in regards to troop placement. I understand the rationale behind the fog. Its there to ratchet up the tension and add to the spooky fear factor but errant cameras should not have to be part of the deal. As the mission progressed in difficulty, so did the enemy phase dragged on. With multiple soldiers, monsters and occult beings, the Nazis troop movements take ages to complete and there’s no speed up key or skip option. ACT is very much a linear experience. It doesn’t have the base build trappings and research of XCOM. Its focus is much more on the narrative. The world of Lovecraft and the Achtung! Cthulhu spinoff has been faithfully recreated as a turn-based strategy game. Fans of the Occult and people looking for something completely different to the norm will be pleasantly surprised by this title. The historical setting has been spun into a truly otherworldly experience. The further you venture into the forest of fear, the more bizarre the combat becomes. Recommended for strategy fans searching for a spooky adventure into the nightmare world of the Black Sun.